Listening in on Amazon’s fourth-quarter earnings conference call can be a bit like watching paint dry but fortunately for you, I will spare you the boredom and cut right to the chase. 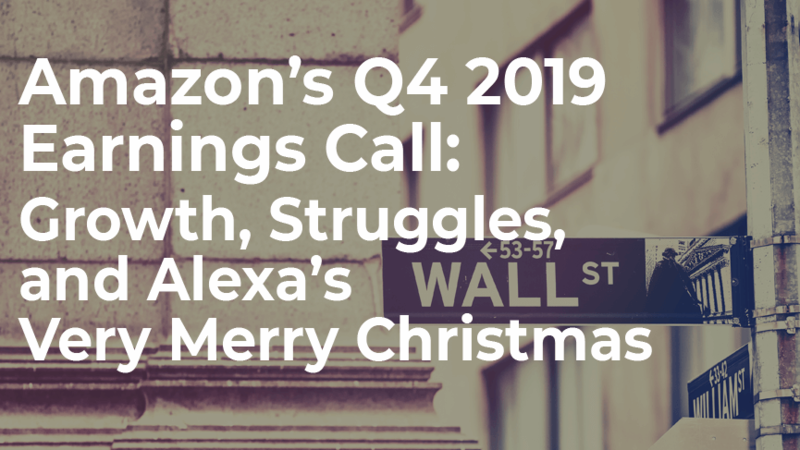 The earnings conference call in and of itself lacked anything substantive as it relates to us as Amazon FBA sellers, however, the earnings report issued shortly before the call on January 31st, 2018 is riddled with golden nuggets. Amazon killed it in the 4th Quarter, beating Wall Street estimates. This was necessary as Amazon had seen sales slumps in the 2nd and 3rd quarters of 2018. Furthermore, they have a very optimistic outlook on the Amazon FBA business model as more than half their sales come from 3rd party vendors (that’s us) and they are going to make significant investments in improving 3rd party toolkits. This is fantastic news! Not everything was rosy in its Q4 earnings report as it’s Q1 2019 earnings forecasts came in lower than Wall Street projections. It’s not easy to maintain a brick and mortar business (that is, after all, why we’ve opted to be Amazon FBA sellers) and Amazon is finding this out the hard way. The only negative that came out of the 2018 Q4 financials was related to “lower gross margins” on the retail side of their business. Translation: even Amazon has a hard time selling in physical stores, a trend they created and that we will continue to see moving forward. Brick and mortar businesses are on the decline. Amazon is on a mission to make inroads within the physical product space as is evident with the acquisition of Whole Foods and the launch of cashless stores such as Amazon Go, Amazon bookstores, and Amazon 4-star stores. Unfortunately, even with these ventures, Amazon reported a 3% year-over-year decline in physical stores sales. That’s not to say they can’t turn this around as their rockstar team has proven time and time again. For now, this has been the biggest drag on the company. Here’s something to be on the lookout as you gear up for your next product launch: How can you align your product to tie in with the functionalities of Alexa? Check out this golden nugget Jeff Bezos dropped in the earnings report. The bottom line is Amazon is taking over the world… lol! You made the right choice to partner with a very forward-thinking organization and by the looks of it, more investment will be made for 3rd party sellers in the days to come. So here’s to a bright future! Keep crushing it!